In the art of flower arrangement, nothing is more fluid, more precise and more elegant than the Japanese flower arrangement, the ikebana or kadō, which for the Japanese, means the way of flowers. Discipline is very important in ikebana, so too, the mathematical form, the scalene triangle, which is the main guide employed in any ikebana arrangement. Its three points represent a hierarchy – the sun, moon and earth or heaven, earth and man, in that order. In the West, floral arrangements usually employ a number of flowers and foliage, creating large bouquets and posies, oftentimes profuse with color. Large and colorful blooms are often used to great effect, placed (seemingly) at random in a container. Ikebana is in such contrast with the way flowers are arranged in the West. Ikebana is not only a simple flower décor. 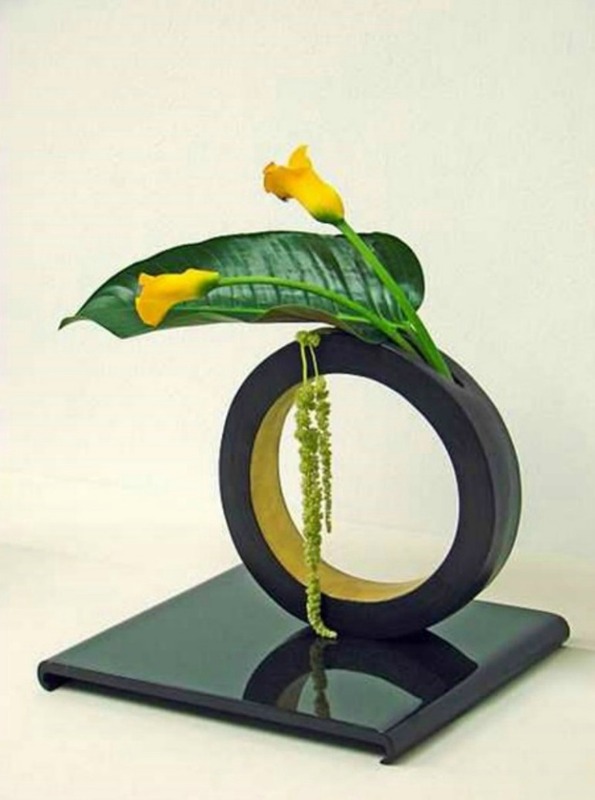 Ikebana is a strict discipline, with several guiding principles. The art form treats the whole arrangement as a living thing where humanity and nature come together. It also supports minimalism in its arrangements. The Japanese flower arrangement is an art form, which encourages creative expression, but it is confined to certain rules of construction that guide every single arrangement. It makes use of flowers, grasses, leaves and living branches. The core of its beauty comes from the graceful lines, natural shapes and color combinations. The meaning of the arrangement is very much part of the whole presentation. One can say that is combines elements of painting and architecture in its creation. The development of Japanese floral art could be ascribed to the love of nature by the Japanese. Appreciation of nature is almost a religion in Japan. The people have a strong bond with natural surroundings and make as extreme effort to provide even a bit of green space in their crowded concrete jungles. It is very rare to see a house in Japan that does not have even a single container of fresh flowers. Flower arrangements in Japan are in the same level as painting and other objects of art, such as sculpture. Ikebana is concerned with creativity, it has specific theories and it has a 600-year history of its own. And like other forms of art, it can be done by men and women. Before one can be involved in ikebana, the person must first be very aware of nature – its order and rhythm, its changing phases, its seasons. Ikebana’s aim is not to bring nature into the home. It is the embodiment of nature as a whole, and the arrangement creates a link between the outdoors and the indoors. Therefore in a single arrangement, you will see blossoms, living br`anches and leaves. Ikebana flower arrangement is assymetrical. Just like any form of art, is also uses empty space as an important element in its composition. There should be harmony among the container, the materials used as well as the setting. These aesthetic elements are shared by ikebana with traditional Japanese design, architecture, gardens and paintings. The Japanese floral art originated from a Buddhist ritual. By the mid-15th century it received its status as an art form and several schools, espousing different distinguishing styles but following the same principles emerged. The oldest was started at the Rokkakudo Temple in Kyoto, where a priest was also an expert at flower arrangement. He lived by the lake, which in Japanese is ikenobo. And this became the term used for the art of flower arrangement that the priest introduced. Today, the top three schools are, in chronological order: Ikenobo, Ohara and Sogetsu. 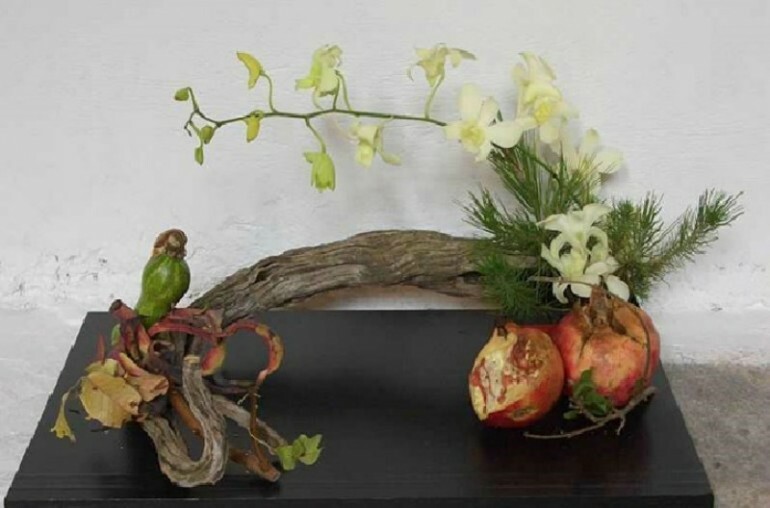 Regardless of school, ikebana arrangements make use of plant materials, including flowers in full bloom, fruits, moss, grasses, leaves and branches. Flower buds, seed pods and withered leaves are surprisingly good materials as well. It is the selection of the each element that goes into the arrangement which is critical. Afterwards it is the artist’s or the arranger’s artistic eye and technical skills in combining the materials that will play the major role in the beauty of the arrangement that has no equal in nature. Of equal importance is the container, which could be chosen to complement the materials selected for the arrangement, or provide inspiration for the creation. The size of the container is considered for its suitability to the space where the arrangement will be positioned, and the materials to be used are cut in proportion to the container’s size.